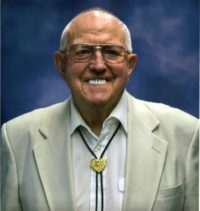 Paul Jacob Flax, Sr., age 84, of Hays, KS, passed away on Sunday, July 8, 2018 at HaysMed. He was born on February 22, 1934 in Ransom, KS to Frank I. and Catherine Flax. His mother, Catherine died in 1942 and Frank married Clara Weber. Paul attended Ellis High School and graduated in 1951. After high school, Paul enlisted in the United States Army and served his country from 1954-1956. He had worked in the oilfield for most of his life and was a driller for Abercrombie Oil Company for over 31 years. He lived in Ransom and then moved to Ellis. On September 7, 1957, Paul married Dolores Ann Rupp in Ellis. The family then moved to Hill City, where he lived for 55 years. In 2015, he moved to Hays. He enjoyed his family, nieces, nephews, camping and playing cards. Paul played the accordion for Andy Anderson Dance Band and played monthly music with his accordion at various nursing homes in the area. He was devoted in his Catholic faith and was a lifetime member of the VFW Post 9139 in Ellis. Survivors include his daughter; Sharon Kay Flax of Phillipsburg; two sons, Paul Jacob Flax, Jr. and his wife Julie of Culver, KS, Bernard “Bernie” John Flax and his wife Teresa of Wichita; three brothers, Alfred Flax and his wife Ida of Wichita, Walter Hicks of Missouri and George Weber and his wife Charlotte of Wichita; two sisters, Agnes Richmeier and her husband Edwin and Dorothy Weber both of WaKeeney; four grandchildren, Cody & Kylie Flax, Courtney Johnson & Brandy Clinton; two great-grandchildren, Trinity & Paisley Johnson as well as a loving extended family. He was preceded in death by his parents and stepmother; beloved wife, Dolores whom passed in September of 2008; twin sons, Gerald & Derald and son, Gregory Flax; sisters, Minnie Flax, Rosie Hicks, infant sister, Catherine Flax, Albertina Fehrenbach and her husband Frank, Virginia Weber Robinette and her husband Danny; brothers, Leonard Weber, Gilbert Flax and his wife Seraphine. Funeral services for Paul will be held at 10:00 AM on Thursday, July 12, 2018 at St. Mary’s Catholic Church in Ellis. Burial will follow at St. Mary’s Cemetery. Visitation will be Wednesday, July 11 from 4-8:00 PM with a rosary and parish vigil service at 7:00 PM all at the Keithley Funeral Chapel. Visitation on Thursday will be from 9:00 AM until service time at St. Mary’s Catholic Church. Memorial contributions can be made to the St. Mary’s Cemetery Fund and/or to the Masses. To share a memory or to leave condolences, please visit www.keithleyfuneralchapels.com or can be made via email at keithleyfuneralhomes@gmail.com. Arrangements are in care of Keithley Funeral Chapel, 400 E. 17th St., Ellis, KS 67637.